We are so grateful for everyone's faithful and generous support. As we do not receive funding from provincial or federal governments for our programs and services, we are dependent on the generosity of like-minded individuals and businesses. Consider becoming one of our monthly giving partners and help us make a difference in the lives of those who are hungry, hurting and homeless in North Bay. Every contribution is very much appreciated and needed. Tax receipts are provided on an annual basis and will include all gifts given in a calendar year. All donors receive a monthly newsletter from our Executive Director informing them about what their donation contributed to. 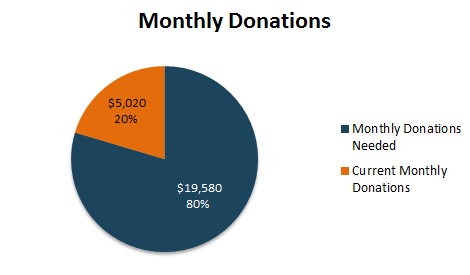 By joining our monthly giving program, you are helping to ensure that we have a reliable and steady source of revenue to keep our programs and services going. This will help us to plan more effectively for the future and will give us freedom to think about new programs that will help improve the lives of those we serve.